When it comes to healthy fitness foods, oatmeal and oats are the undisputed champions of whole grains. Inexpensive, loaded with healthy soluble fiber, and incredibly versatile as an ingredient in everything from meat loaf to protein shakes, oats and oatmeal are a staple in the diet of nearly every bodybuilder, fitness model, athlete or healthy person. But what makes this humble grain that usually found its way into horse and cattle feed such a nutritional powerhouse? And what if you dont like eating oatmeal? Can you still get the benefits without the mush? Believe it or not, oats dont have to be served hot in bowl with cinnamon and raisins. I said this grain was versatile, remember. Read on to find out why you need to include oats in your diet, if you already arent. And if a bowl of oatmeal isnt doing it for you, well look at some alternative ways of preparing them that can let you have your oats and eat them too. Oats are the harvested seeds of the common oat plant (Avena Sativa). Scientists believe that oats were actually a descendent of ancient grains like wheat and barley. Oat grains have been found in Egyptian remains dating back to 2,000 B.C., but they were a weed, and not domesticated or cultivated. The oldest known domesticated oats were found in ancient caves in Switzerland. The first oats were brought to North America in 1602 by European colonists and their cultivation rapidly spread outward as the continent was settled. In 2000, the leading oat producing states in the U.S. were Minnesota, North Dakota, Wisconsin, South Dakota and Iowa. Even today, less than 5 percent of all oats commercially grown in the U.S. are used for human consumption the vast majority still finds its way into livestock feed. Like wheat or rye, oats are simply the seeds of grain plants in this case the Avena Sativa plant. The plants are cut and allowed to dry in the sun and then the grain heads (which hold the seed kernels) are separated by machine. The stems are used for straw, and the grain heads are either stored or sent to a mill for processing. During processing, the kernel is removed from the grain head and the outer hull is stripped away from the inner oat groat (basically the inner seed which contains the endosperm and soluble fiber.) The outer husk can be used as livestock feed or turned into insoluble oat fiber (which, like wheat bran, is composed primarily cellulose.) Because oat groats are higher in fat than other grains (this is not a bad thing they are healthy fats), the oat kernels are stabilized using heat to help prevent the oats from turning rancid. 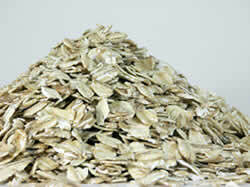 The oat kernals are then sorted by size and cut using steel blades into different sizes. Once theyve been cut, they can be milled into different forms of oat products and packaged. Oats are milled into six basic forms that you can typically find on the shelves at your local grocer. Each form of oats produces a different texture when prepared, and the type of oat you choose can have different nutritional characteristics, as well as cooking time. Whole oat groats are the uncut, whole oat seed kernel. This is the basic raw material for all other oat products, including rolled, cut and flaked oats. Its fairly difficult to purchase whole oat groats at the store, but health stores that sell bulk grains will sometimes carry them. Whole oat groats can be cooked or steamed in a similar fashion to rice or whole wheat kernels, but because of their size, the cooking process can be lengthy – up to an hour. Cooking them in a pressure cooker can speed up the process. The primary benefit to eating whole oat groats is that they are they are digested very slowly by the body, making them extremely filling and reducing their glycemic load on the body. They also have the highest nutritional value of all of the forms of oats and oatmeal. Steel cut oats are exactly what their name implies: whole oat groats that have been cut into little pieces using giant steel blades. The oats can be chopped into different sizes, from large pieces to very fine, small pieces. The advantage to steel cut oats is that they have a faster cooking time than whole oat groats, while maintaining all of the nutritional value of the whole grain. Steel cut oats can be purchased at most grocery stores, and will be often called Irish Oats, Irish Oatmeal, or Steel Cut Oats. They take approximately 20 minutes to prepare, and have a very different texture from the usual Quaker Oatmeal your mother or grandmother might have fed you. They are more grainy and less mushy than rolled oats and many people who dont like the texture of rolled oatmeal find steal cut oats much more palatable. Steel cut oats can also be incorporated into breads and baked goods, including muffins and cookies. Scottish oats are steamed, steel cut oats than are then ground into a oat meal. Depending on the manufacturer, the oats may then be toasted to create a richer-flavored oatmeal, or combined with some oat bran to make the oat meal creamier. Many people confuse Scottish Oats or Scottish Oatmeal with steel cut or Irish Oats they are actually two different things. The main difference between the two is that Scottish oats are ground into a meal after the cutting process, which improves its ability to absorb water and allows a shorter cooking time. Steel cut oats or Irish oats, on the other hand, do not go through the grinding process. Rolled oats and oat flakes are what most people think of when they think oatmeal. Thick Rolled Oats: These are steamed whole oat groats that are rolled into a thick flake. They are the slowest to cook of all the rolled oat products (they typically take about 20 minutes to prepare), but they have a texture that falls somewhere between steel cut oats and quick oats. They have a thicker bite than regular rolled oats and are a bit chewier (in a good way.) Because of their size, they are the slowest to digest of all of the rolled oat products, making them very filling. Regular Rolled Oats (also known as Old Fashioned Oats): These are steamed whole oat groats that are rolled into a thin flake. This is the oat that you generally associate with a bowl of oatmeal. They take less time to cook than thick rolled oats (usually about 10 minutes) and are a bit mushier and more gelatinous when prepared. Regular rolled oats are typically called for in recipes, such as cookies, breads and granola (although thick rolled oats make a fantastic granola.) Because the flakes are thinner, they digest a bit faster than the thick cut version. However, were talking degrees here, and regular rolled oats are an excellent source of whole grain nutrition. Quick Oats: Quick Oats are made from steel cut oats which are finely cut, steamed and then rolled into small flakes. Because they begin with smaller pieces, they cook very quickly usually in less than 3 minutes. From a nutrition standpoint, they are pretty much on par with regular rolled oats, although their smaller size does allow the body to digest them more quickly, which makes them slightly higher on the glycemic index than regular rolled oats. Instant Oats: Instant oats steel cut oats that are steamed, finely cut and then pre-cooked. Instant oats are what you typically find in the pre-flavored or pre-sweetened instant oatmeal packets available at the store. The primary advantage to this form of oats is convenience and cooking time. Instant oats can be ready to eat simply by adding hot water. Regular (unflavored) instant oats typically do not contain any added sugar (although they may contain some added salt.) The flavored varieties like Maple and Brown Sugar Instant Oats will have around 12 grams of sugar and may be artificially flavored. Be sure to read the ingredients to know what you are getting. In terms of nutrition, they offer many of the benefits of regular oats, but less per serving, due to the added flavorings, sugar and salt. Oat bran is made from oat groats that are ground into a fine oat meal and then combined with some of the outer bran or husk of the oat. This increases the overall fiber content of the oatmeal, and makes it slightly higher in insoluble fiber than rolled or cut products. Oat bran cooks fairly quickly and has a really smooth, creamy consistency, similar to cream of wheat, but a bit toothier. Oat bran is a nice substitute for rolled oats when you are looking for a change. Oat bran typically has about 6 grams of fiber (3 grams of soluble and 3 grams of insoluble) versus quick oats, which has 4 grams of fiber (2 grams of soluble and 2 grams of insoluble) per serving. Oat bran also contains more protein and slightly more fat. It can be a great addition to breads or added to granola for a little extra fiber. Oat flour is made from steamed, steel cut oats which are then ground into a fine powder. It can be used as a substitute for wheat flour in recipes, however, because it contains very little gluten, it requires the addition of a leavening agent like baking soda or baking powder. While most oat flours and oat products do not naturally contain gluten, they are sometimes processed using milling equipment that comes in contact with grains that do contain gluten, like wheat. Oat flour, like all whole oat grain products, contains a high amount of soluble fiber as well as some insoluble fiber. Typically it is mixed with other grain flours in bread and baking, although there are methods for baking exclusively with oat flours. The jury is still out on whether organic oats are worth the price. In terms of pesticide exposure, grains in general dont absorb as many chemicals as soft-skinned fruit like peaches or other fruits or vegetables that are consumed with the skin-on. Most pesticide exposure in grains like oats is restricted to the outer husk, which is typically not included in human foodstuff. They also arent exposed to the kind of antibiotics or growth hormones that cause concerns with meat, poultry, eggs and dairy. However, many people choose to buy organic even for grains because philosophically they support less use of chemical fertilizers, pesticides or herbicides. If this is important to you, then springing for the organic oats makes sense. Vitamins and minerals like Vitamin B6, iron, calcium, thiamine, riboflavin, magnesium, zinc, phosphorus, magnanese and trace amounts of vitamin E, folic acid and potassium. The amount of vitamins and minerals may vary slightly, depending on how processed the grain is. Whole oat groats have the highest natural vitamin and mineral content, with steel cut oats following up a close second. 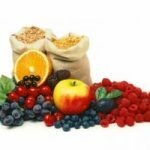 Oats, Soluble Fiber & Health: Whats the Connection? Oats, oatbran and oatmeal have the highest soluable fiber (specifically Beta-D-glucans) content of any commercial cereal grain. Heres where we get to some of the health and diet benefits of oats and oatmeal. First, the dissolved soluble fiber from oats makes people feel fuller and more satisfied for longer after eating oats or oatmeal. This can reduce the tendency for people to over-eat. The soluble fiber in oats also slows down the absorption of glucose by the body, stabilizing blood sugar levels which can help with maintaining your weight or even losing body fat when combined with exercise. This is why oats are one of the best sources of complex carbohydrates available and make a great breakfast or pre-workout snack. There is also some evidence that the soluble fiber in oats and oatmeal may also usher some dietary fat through the digestive system un-absorbed by the body sort of like a natural Alli™ without the nasty side-effects. Oats also have anti-inflammatory properties, especially when applied topically to the skin. Products like Aveeno, for example, use colloidal oatmeal as a topical anti-inflammatory ingredient in everything from bath washes to soap to shaving cream. The primary benefit of oats and oatmeal and the one that has gotten the most attention in recent years is the effect that oatmeal has on blood cholesterol levels. Ongoing research has shown that the Beta-D-glucans in oats, oat bran and oatmeal appears to lower low-density lipoprotein (LDL) levels in the blood (also known as bad cholesterol), possibly reducing the risk of heart disease. And it appears to do this without adversely effective the favorable high-density lipoproteins (HDL), also known as good cholesterol. The mechanism for reduction in blood cholesterol is still not fully understood. However, scientists and researchers have a few theories. One theory is that the Beta-D-glucans bind to the cholesterol in the food we eat and literally sweep it out through the digestive tract before it has a chance to be absorbed by the body. Another theory is that the soluble fiber in oats, oatmeal and oat bran blocks the re-absorption of bile (which is used by the body to digest lipids like cholesterol) into the body, which forces the liver to draw cholesterol out of the blood, effectively lowering serum cholesterol levels. In all likelihood, its a combination of both of these mechanisms that make oats such a potent cholesterol reducing food. A study published in the Archives of Internal Medicine found that eating high fiber foods, such as oats, oatmeal and oat bran, helps prevent heart disease. The study followed nearly 10,000 American adults for 19 years and found that individuals who are the most fiber (at least 21 grams per day) had 12 percent less coronary heart disease (CHD) and 11 percent less cardiovascular disease (CVD)versus those who ate only 5 grams per day. Individuals who consumed the most soluble fiber (like you find it oats) did even better. They had a 10 percent reduction in the risk of cardiovascular disease and a 15 percent reduction in the risk of coronary heart disease. Studies have shown that individuals with high blood cholesterol levels (above 220 mg/dl) can expect to lower their total blood cholesterol by as much as 8-23 percent just by consuming 3 grams of soluble oat fiber or the amount in one and a half servings (about 60 grams dry) of quick oats. While these percentages may seem small, they actually are very significant each 1 percent drop in serum cholesterol translates to a 2 percent drop in the risk of developing heart disease. So even if you were conservative and estimated a moderate, 15 percent drop in serum cholesterol, you would be looking at a 30% decrease in the risk of developing heart disease or stroke by consuming oatmeal, oats, or oat bran. One of the most encouraging findings around the consumption of oats, oatmeal, oat bran and other sources of soluble or sticky fiber is that recent research suggests that consumption of these foods may actually be as effective at lowering serum cholesterol as prescription statin drugs like Lipitor, especially when combined with other cholesterol-lowering foods. It appears that by combining oats, oat bran or oatmeal with other foods that have been shown to lower cholesterol things like nuts, soy and other sources of plant sterols the cholesterol-lowering properties of the foods combined can produce extremely dramatic reductions in serum cholesterol levels. A University of Toronto study conducted by Dr. David Jenkins and published in theAmerican Journal of Clinical Nutrition found that combining nuts, soy and foods high in soluble fiber (like oats) together was nearly as effective at reducing blood cholesterol as taking prescription statin drugs. 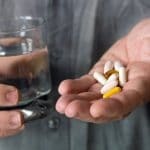 The research showed a 30.9 percent decrease in serum cholesterol levels from the statin drugs, and a 28.2 percent reduction in cholesterol by combining the foods alone. Jenkins calls this the portfolio approach to diet, where you combine certain beneficial foods to amplify the specific health benefit. Its not necessarily a fat or weight loss diet, but rather an approach to structuring your diet and food choices that maximizes the protective qualities of food. Oats, oat bran and oatmeal play a foundational role in Jenkins portfolio for reducing cholesterol. The great part about this is that many of these other natural cholesterol-lowering foods, like nuts and soy (soy milk or soy protein powder) make great additions to that morning bowl of oatmeal or granola making it easy to get the portfolio diet effect each day without much effort. While oats may help you naturally reduce blood cholesterol, if you are currently being treated for high-cholesterol its important to consult your physician before attempting to reduce cholesterol with diet alone especially if you are current on cholesterol-lower prescription drugs. Oats, Oatmeal and Oat Bran: Antioxidants? Oats also contain avenanthramides, an antioxidant unique to oat products. Another study from Tufts and published in published in Atherosclerosis looked at human subjects who were given purified avenanthramides over a 24-hour period. The researchers found that the oat phenols significantly reduced the production of certain molecules that facilitate the attachment of monocytes to the arterial wall one of the precursors of atherosclerosis. When LDL cholesterol oxidizes, it becomes sticky, which allows it to more easily bind to the walls of the arteries, potentially causing blockage over time, as well as a reduction in the elasticity of the arteries (hardening of the arteries.) By blocking oxidation of LDL cholesterol, the LDL cannot bind as easily to arteries, and has more time to be swept from the blood before it causes damage. Oats, oatmeal and oat bran are not low calorie foods. There are 140 calories in a 1/2 cup dry (39g) serving of oatmeal and 26 grams of carbohydrates. However, because of the high soluble fiber content, oats are very filling and nutritionally-dense and as part of a calorie-controlled diet can help you lose weight by encouraging you to eat less. And because they are whole grains, they dont cause rapid increases in blood sugar like more processed grains, which makes you less susceptible to feeling hungry later in the day. Can I Eat Oats if Im On a Candida Diet? A common question is whether oats can be consumed on a Candida Diet. Can I Eat Oats if Im On a Gluten-Free Diet? While oats are generally considered very low in gluten, oats can still be problematic for people on a gluten-free diet. Some individuals with celiac disease have no problems consuming oats or oatmeal, while others with a high level of gluten sensitivity cannot. Its not clear whether the issue is with the oats themselves, which have very little gluten, or the machinery that the oats are processed on, which is often also used to grind high-gluten grains like wheat. So cross-contamination is always a concern. Only oats that are labeled gluten-free and the label specifically indicates are notprocessed on machinary that comes in contact with gluten-bearing products should even be considered by people with mild gluten-sensitivity. If you want to play it safe, avoid oats completely if you have gluten sensitivity. In fact, the University of Chicago Celiac Disease Center takes a very conservative approach to oats and places it on their Do Not Eat list for people with celiac disease or gluten-sensitivity. Oats, oatmeal and oat bran can be prepared a number of ways, depending on the type of oat and its cut. The traditional way to prepare oats is as a hot cereal or porridge. Depending on the type of oat, cooking time as well as texture, will vary. If you are pressed for time, quick oats and/or instant unflavored oats are your best bet they will be ready in under 2-3 minutes. However, oat groats, thick rolled oats or regular/old fashioned oats will take longer between 20 minutes (for thick rolled oats) and an hour (for oat groats.) The longer cook time is worth the wait for many people, who find a thicker oatmeal more flavorful, filling and pleasant. Oat bran is probably the most neglected of all the oat products, which is a shame because it has a phenomenal, creamy texture that is enhanced with the addition of fruit or nuts. Its also quick to cook, yet retains most of the nutritional value of rolled oats. Instant oats are just that: instantly ready-to-eat once you add water. Theyre a great choice when you are on-the-run and want to incorporate some of the healthy benefits of oatmeal into you diet without having to fuss with the longer cook times of regular oatmeal. However, consider staying away from the usual instant flavored oats, which can be high in sugar, sodium and artificial flavors. Cooking oatmeal really requires nothing more than a sauce pan, some water and the oats. You can also prepare oatmeal in the microwave, cutting minutes off the cook time. Some forms of oats are better suited for the microwave (specifically quick oats, oat bran and regular oats), while others need to be slow-cooked to preserve their unique texture for example thick or steel-cut oats. To make a slightly richer, creamier oatmeal you can replace some or all of the water with skim milk or soy milk when preparing the oatmeal. Oats may also be baked or prepared in a crock pot, which results in a very unique, creamy oatmeal that is very different in texture from the standard Quaker Oats you might have been used to as a child. Even though most people think of oats as a hot cereal, dont get the idea that oats are only for breakfast. They actually can be incorporated into a wide-range of recipes, dishes and baked goods, giving you all of the benefits of oats, without having to consume them on their own as a breakfast food. For instance, one of my favorite snacks is a healthy no-bake cookie recipe made with instant or quick oats, whey protein and peanut or almonds butter. While most people raise their eyebrows when I mention this recipe, once they taste it, theyre hooked. Substituting oats or oatmeal for higher-glycemic carbs like breadcrumbs or crackers in traditional recipes like meatloaf, salmon cakes or patties, or meatballs. Using them as a substitute for whole wheat flour in breads, muffins, or high protein oatmeal pancakes. Granola: A Great Way to Get Your Oats! Finally, dont forget the granola that healthy staple of hikers, soccer moms, fitness fanatics, tree huggers and kids everywhere. Based on the shelf-space dedicated to granola products at the grocery store, its never been more popular. Oats are the primary ingredient in granola, and provided the granola isnt too high in sugar or fat (the store-bought products can be) its an excellent and tasty way to incorporate the health benefits of oats and oatmeal into your diet. If the price tag for pre-made granola scares you away (it can be as expensive as $6 dollars a bag), or if you want to make your own granola and customize the sugar and ingredients, check out this low-sugar, low-fat homemade granola recipe. The great thing about granola is that it often contains other heart friendly and cholesterol-lowering ingredients like almonds, walnuts, cherries or cranberries, which combined with the oats can boost the nutritional and antioxidant properties of oats, facilitating the portfolio diet effect we discussed earlier. While many people like the nutty flavor and chewy texture of oatmeal, some find it a bit bland especially if they are used to eating sugary or processed cereals. Fresh fruit like sliced bananas, fresh sliced peaches (delicious! ), chopped apple, frozen or fresh blueberries, raspberries, blackberries or strawberries. One of the advantages to oats and oatmeal is that they can be extremely inexpensive. A 42 oz (2 LB, 10 oz or 1.19 kg) carton of generic brand quick oats can be purchased for around $2.50 on sale. Expect to pay slightly more when they arent on sale. This size provides 31, 1/2 cup servings of oatmeal or enough for a month if you are eating it every morning. Prices for other oat products, like organic thick rolled oats or oat bran can vary, and are usually higher than the regular or quick oats varieties. In terms of the difference between generic brands and Quaker Brand oats, there really is none, with the exception of price. Nutritionally they are the same, and the flavor is consistent. So go ahead and buy the generic brand, if you want. Purchasing oats in bulk at a local health food store or Whole Foods, as well as ordering them online in bulk can be another great way to save money on some of the more specialty or expensive oat products. Just make sure you calculate your shipping costs in, since they can impact whether it makes sense to buy online. Whats Your Favorite Way of Eating More Oats? Id love to hear from Answer Fitness readers about their favorite ways to incorporate more oats into their diet. If you have a great recipe or novel way of using oats, oatmeal or oat bran in recipes or dishes, leave us a comment or drop me an email using my contact form. Or just drop us a note telling us why you love (or hate) oatmeal. Quite a long article! But mmmmm.. I love oats. I tried them freshman year of college, and I have loved them ever since! They offer a crunch that cereal doesnt have, except with tons more flavor. Thanks for stopping by Yongho! I eat oatmeal or some form of oats at least 1-2 times a day. Have a great cholesterol profile Stop by again. Bobs Red Mill sells oats in bulk. 25 lbs. cost $15.36 plus $10.95 for shipping. Thats only $1.05 a pound. Where can I buy oat bran, by the pound? I used to get it at Schnucks in Belleville, Il where I live. I discovered muesli while traveling in Amsterdam a couple months ago. I got home and couldnt find any and decided to make my own. My local Cub Foods (supermarket) has thick rolled oats and oat bran for 89 cents per pound in the bulk section. Also from the bulk section I mix together a selection of nuts, and a selection of dried fruits ( raisins, cherries, cranberries, plums, etc) and mix them to my liking in the morning with some cold milk. I let it sit for a few minutes to soften the oats a little bit, and have a healthy, cheap, and delicious breakfast. Oats in a smoothie? Thats an excellent idea, thanks! I love oats. Want to know about storage of oats. Seems to me as a staple food for pioneers that the oat does not need any fancy glass sealed jar for storage. Seems that it would be fine to just put them into a jar without a lid and keep in the cupboard. Can anyone advise me? J Watts, actually whole grain oats do need to be stored more carefully than you might expect. The major cause of spoilage in any dry food is rancidity. Rancidity happens when oils and fats in a food oxidize and their chemical structure is changed. This typically results from heat, light or prolonged exposure to oxygen. Whole grain oats contain some fat, so they can become rancid over time especially when they are not stored properly. If youve ever had a carton of oats handing out at the back of the cupboard for a year or two and then stuck youre nose down in them, youll know what rancid smells like. There will be an off scent to the oats that smells like old vegetable oil. On a side note, many people keep vegetable oils around for far too long to the point that people get used to the smell of rancid oil and think this is just how vegetable oils smell. Fresh vegetable oils (with the exception of nut or olive oils) should actually have very little odor at all. If they have a strong smell, they are usually rancid. Nut or olive oils should smell slightly nutty, but fresh. Consuming rancid oils is not healthy, because the structure of the fats have changed, and can make them more prone to attaching themselves to the walls of the arteries. So you should avoid them whenever possible. Plus, they just taste nasty. The problem is, people keep these oils way past their shelf life and just think thats the way oil smells and tastes. In terms of oats, most oats have a shelf-life of about 18 months under normal storage conditions. If they are canned for long term storage, in a sealed, aluminum can with oxygen absorbers, the shelf life can be extended to up to five years. If you are consuming oats on a regular basis, its fine to keep them in their cardboard container. Placing them in glass jar is also fine. In both cases, however, you will want to keep them sealed or covered by a lid, since you do not want bugs or mice playing around inside your oats. For maximum shelf life, store in a cool, dark location. Hope this helped answer your question! We are looking for the best deal on oatmeal in bulk. We are thinking of a 25 pound bag to get started. Where is the cheapest 25 pound bag of oatmael with cheap shipping? Ive found that the easiest way to cook steel-cut oats is using a wide-mouthed Thermos. Simply add some hot tap water into the thermos and seal to preheat the Thermos. Then after about ten minutes, add a quarter cup of oats and a cup of boiling water. Seal tight, and go to bed. The next morning, breakfast is ready. I dont think there is any comparison between steel-cut oats and oatmeal I dont like instant oats, or even quick-cooking, but steel-cut have a wonderful flavor and texture just on their own. I do add some dried fruit and walnuts for an extra nutritional boost after its done cooking. Its also, as others have said, filling Ive found myself at 3pm realizing that I never had lunch. Do give steel-cut a try even if you dont like oatmeal. Its like an entirely different food. Cheerios has a glycemic index (GI) rating of 74 and a glycemic load (GL) of 12 versus old fashioned rolled oats, which have a GI of 46 and GL of 9. I suffer from gout and the cause is too much uric acid that the body makes,it comes from the purin content in foods, I have been told that oats contain hi amounts? would appreciate your coments. I was told about Steel Cut oats and I bought some from a health foods store and it was less expensive buying it in bulk so I used a plastic bag and filled it up. I do not regret buying steel cut oats, they are very tasty! And I used to despise oatmeal I mix 2 cups of water in a pan and add two scoops of Biochem Whey Protein and mix it with water and add half a cup of oatmeal to it and bring it to a boil for a few min then let it simmer for about ten min..then when it is done, I add a sprinkle of cinnamon and raisins..mmm I plan on buying some dried blueberries or cranberries and try that too. Enjoy! I live in Toronto. I would like to get raw Avena Sativa, like the one coming from the farm right now. Is it possible get it? Where? Thanks. I make an oatbran pancake: take 2 tablespoons of oatbran, 1 tablespoon of wheat bran [or maybe just 3 of oatbran pehaps] add an egg, and sufficient nonfat skim milk to make into pancake consistency. Using cooking spray to grease the pan, cook the pancake until golden on both sides. I eat non fat yoghurt with lemon juiceor fruit [heated a bit is great] with yoghurt. I look forward to my breakfast every morning !!! Tis a treat. I put two tablespoons oat bran into skimmed FRESH LIVE yoghurt every morning along with some sweetener, a few drops vanilla essence and some cinnamon. Very low fat, low sugar and very tasty. I have high cholesterol and I am now getting into oatmeal as a way to drop it . I hate the consistency of oatmeal, steel-cut or otherwise. So, my question is.will eating raw oats, say in yogurt, work in the same way in my arteries as cooked oatmeal does? I love oatmeal, and I would like to buy a big amount of it. Could someone tell me if I could buy it in the feed and supply store ? I mean for livestock feeding. Is it good for human being?? If not, where could I get the best deal for oatmeal? ?